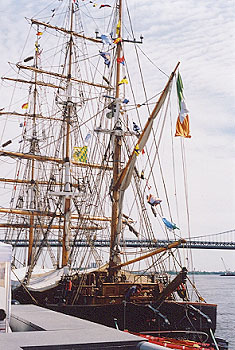 Jeanie arrived in Philadelphia on June 12th on her way north to New York, New England and finally, Canada in October, before she sailed back to Ireland on her return trip. She stayed in Philadelphia until June 23rd. We saw her on June 15th, it was a great weather day. There was a steady stream of visitors while we were there; I heard that 1500 people came to see Jeanie that day, the highest daily number up to that point of the trip north. 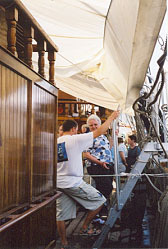 Above: A young crew member talks to a visitor on the guided tour. 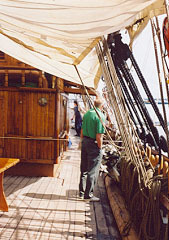 Above: A visitor stands on deck. The central finished wood structures were very beautiful. 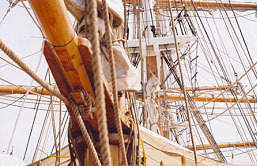 Above: The intricate ropes seen from aft. Above: A view from the deck, looking over to Camden, New Jersey. 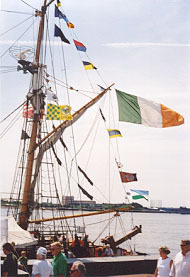 Above: Jeanie's flags - the Irish flag, the Kerry and Corcaigh (Cork) flags can be seen here. 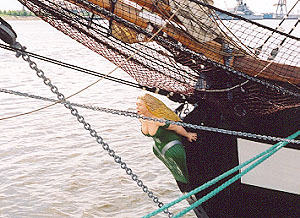 Above: Jeanie's figurehead can be seen here, specially carved for her. 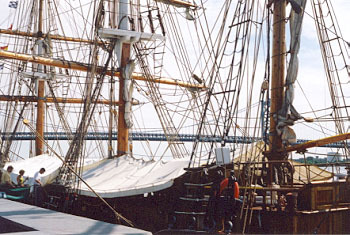 A view of Jeanie's masts: she is a three-masted barque. 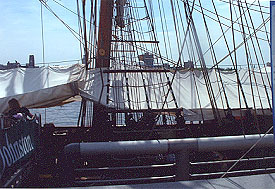 Jeanie's aft section - the captain's wheel can be seen on the right, with the captain's quarters in the center of the photo. WILL SAIL FROM TRALEE, WIND AND WEATHER PERMITTING, ON OR ABOUT THE ______ OF APRIL NEXT. THIS FIRST-RATE VESSEL POSSESSES SPACIOUS ACCOMMODATION FOR PASSENGERS, AND WILL BE FITTED UP IN THE MOST COMFORTABLE MANNER. FOR ALL PARTICULARS, APPLY AT THE OFFICE OF THE OWNERS, MESSRS. JOHN DONOVAN AND SONS, TRALEE. 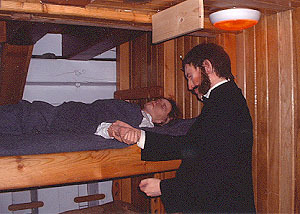 Life-size figures of actual passengers from the 1840's were created for Jeanie's passenger section, which was extremely small, with bunk beds lining each side, and little light. 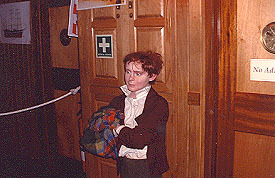 Above is a child; another figure re-created was Patrick Kearney, who sailed to Baltimore in 1849. 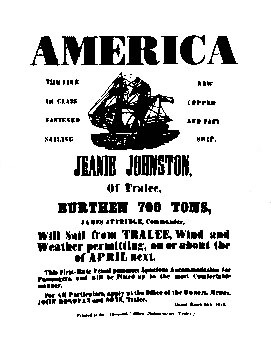 Other figures included a fiddler, and Dr. Richard Blennerhassett, the ship's doctor, who was responsible for the fact that not a single crew member or passenger was lost on any of Jeanie's voyages across the Atlantic (both shown below), in contrast to the many lost lives on the "coffin" ships that sailed famine immigrants to America and Canada. These passenger photos were taken by my sister-in-law, Ann Hazlett. The average number of passengers on a voyage was 193, who traveled without toilets, privacy, and with little food, fresh air, heat, space and light. 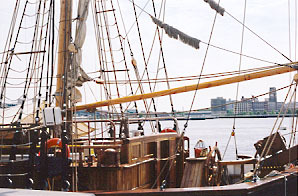 The average length of the voyage between Tralee, Ireland and Quebec, Canada was 47 days. The guided tour provided not only a visual re-creation of Jeanie's passengers, captain and doctor; there were also realistic sound effects, such as singing, coughing, babies crying, conversation between passengers, etc. 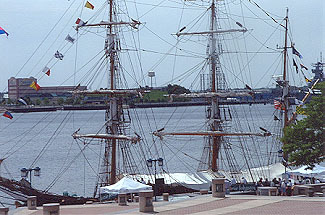 Above: A view of Jeanie from above at Penns Landing, taken by my sister-in-law, Ann Hazlett. Her size can be seen by looking at the tiny people on the lower right. 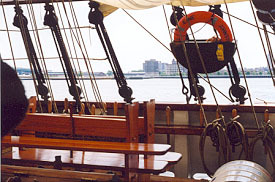 From outside, she seemed longer than I expected, but when we went down below to see the passengers' quarters, it seemed unbelievably small, and dark, there, as it was when she sailed in the mid-1840's, carrying Irish famine emigrants to America and Canada. 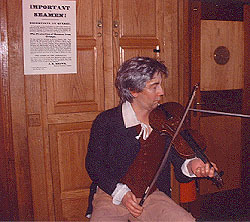 Above: A re-created figure of a fiddler. Above: Dr. Blennerhassett, the ship's doctor, who ensured that not a single passenger or crew member was lost on all of Jeanie's trans-Atlantic voyages.